Spontaneous Acts Of Joyce: Captain Beefheart R.I.P. 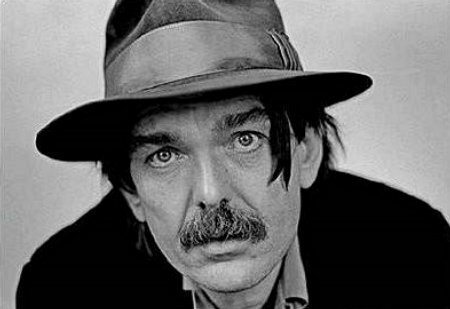 I miss Captain Beefheart who died this past Friday at 69. A.K.A. Don Van Vliet, he was to me the quintessential experimental artist whose vision expressed in music and painting-- let everyone else see. He made his high school classmate Frank Zappa (with whom he had a love/hate relationship)seem mainstream. He made the first music video in the early '70's creating his own ingeniously complex brand of subversion. You gotta love a guy whose answer to "I wanna hold your hand" is "I wanna swallow you whole" from LICK MY DECALS OFF, BABY. Click here for an early 80's interview with Letterman. Then read the following lyrics which my husband knows by heart and regales us with regularly. Hooray for Captain Beefheart. Just another reason I wish you were still on national television. I used to endure Maltin just to see an intelligent person reviewing movies. Van Vliet was a very unappreciated artist. What fertile grounds for innovation with him, Zappa, St Clair(e) , Ry Cooder and the like moving in close circles. I love 'Dust blows forward...' lyrics and it is a toss-up between that and Orange Claw hammer for favorite of mine. A friend of mine thinks it's 'Neon meate dream of a Octafish' but I just don't see it. Great mind, certainly different ; I can only hope that at this moment the wind is 'blowing up him and up the canyon, far as he can see.